When I received my internship acceptance letter from the Who What Wear team, the first question that popped into my head was What am I going to wear? The best part about working in fashion, in my opinion, is that it allows for more creative expression than most other industries (though we've covered how working in a corporate setting can still be stylish). Although I was excited about the endless outfit combinations on my horizon, I was worried my college student budget wouldn't allow me to live up to my full fashion potential. Despite the challenge, I was still determined to dress for the job I want, which in my case is the role of fashion editor. 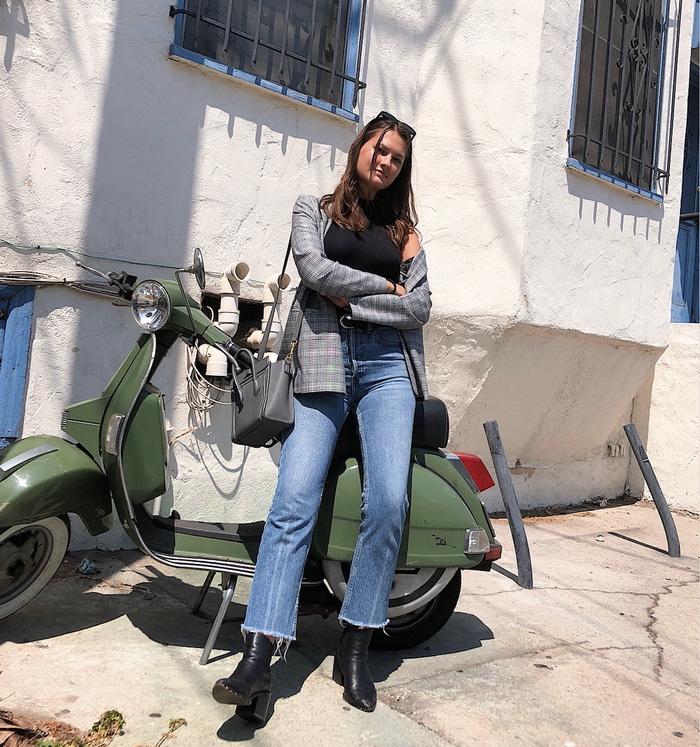 Though I'd love to be shopping as if I earned a full-time salary, I ultimately had to get creative about how to put together editor-quality outfits on my intern budget. Below, I'm sharing the tips and tricks I used to curate a fashion-forward work wardrobe as well as a few of the outfits I wore in office throughout my internship. Tip #1: When in doubt, keep it simple. No one does effortlessly chic style better than the French. So take a note from them and master French-girl style by focusing your ensembles on timeless pieces you will wear over and over again. Even though I bought the blazer (shown above) specifically for work, it has quickly become one of my favorite out-of-office staples. I love how it elevates even the simplest of jeans-and-a-T-shirt outfits. The small blue stripes in this blazer are a fun way to switch up an office staple. Topshop is an amazing place to shop for affordable jeans. Three for one? Yes, please! Tip #2: Find statement items that can be incorporated into multiple outfits. If you're going to spend a little extra money on a statement piece (like this in-demand Réalisation skirt), make sure you can style it a few different ways. By switching up the black T-shirt for a silk cami and the casual sneakers for a pair of black heels, you can bring the outfit from day to night with ease. Amazon should be your new go-to for affordable wardrobe staples. This blogger-approved skirt will be sure to get you so many compliments. These simple sneakers will take you through every season. Tip #3: Try to repurpose pieces you already have. You have more options in your closet (or your mom’s) than you think. Everything I used in this work look, I already had hiding in my college wardrobe. Sometimes you just need to look at your options with fresh eyes. Faux leather is a great way to keep prices down without losing that high-end feel. The higher neckline on this bodysuit makes it office-appropriate. Celebs are all over this Australian brand. Tip #4: Never underestimate the power of accessories. A simple gold bracelet or even a pair of sunglasses can bring your outfit to the next level without adding to the overall cost. I usually opt for a few simple necklaces of contrasting lengths and a classic watch. The office is a great place to try out the minimalistic jewelry trend that's super in this season. This cheap basic can work in so many different outfits. Aritzia has the answers to all your trouser needs. Bring back the '90s in style. Tip #5: Let your personality shine through. During the first few weeks of my internship, I spent so much time in the morning analyzing my outfits and wondering how others in the office would perceive it. As time went on, I started to feel more comfortable expressing my personality through my clothing choices. In the end, fashion is really all about being yourself. So my last tip? Buy pieces you feel happy and confident in, and your personal style will always shine through. Gingham is a great print to help spice up your outfits. I can't believe this gem is on sale! It's a basket bag type of summer. A classic button-down with a modern twist. These simple kitten heels come in three colors, and I'm currently adding them all to my cart. Pair this top with white jeans or trousers for a summer work look. Everyone needs a pair of classic wide-leg trousers. White and patent is a winning combo. Pixie Market is a great resource for modern flirty tops that won't break the bank. I am obsessed with these forest green trousers. Stay comfy all day with these suede mules. Puffy sleeves are having a major moment right now. Now you're all set to dress like an editor, too, no matter what your budget looks like.